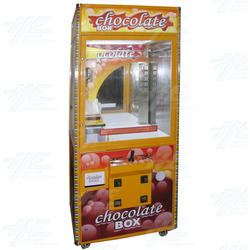 Chocolate Box is a unique crane machine comes with an adjustable refrigeration system which is perfect for candy cranes operating in warm or humid climates. And mainly sells candies, chocolates automatically which won't be affected by humidity or heat. Chocolate Box made by aluminum frame with attractive pattern and colorful LED bar. With lovely music background, it must attract more players to play. Available in Purple Version or Yellow Version. Chocolate Box made by aluminum frame with attractive pattern and colorful LED bar. With lovely music background, it must attract more players to play. Available in Purple Version or Yellow Version. control panel show "time" and "credit". joystick with push button together.